Dirty Harry’s Peak is named after a logger of questionable repute—his logging in the North Bend area earned him the moniker. But don’t let that stop you from enjoying the short two mile hike up to Dirty Harry’s Balcony; it’s about an hour’s trek from the trailhead. Those who wish to go further can hike on up to Dirty Harry’s Museum (the names just get better and better) where you can see Harry’s old GMC truck--the only artifact in this “museum.” But beware—there may still be snow on the trail. To get to the trailhead, take exit 38 off I-90 and follow signs to the Fire Training Academy. You’ll go under the highway; continue until you reach the small parking area. (Don’t forget your Discover Pass!). Follow the gravel path from the trailhead sign until it comes to the paved road to the Fire Academy. There is a bridge over the south fork of the Snoqualmie River—cross it and the trail continues on the other side, on the right. Once there, you’ll find that this is the most well-marked trail you’ll ever hike. Signs for Dirty Harry Peak Trail will be on low posts all the way to the Balcony. This is to distinguish the main trail from the many spurs from it that that lead to spots for rock climbers. The area is a favorite of the ropes and piton set. While the spurs lead off to cliff faces, you’ll still encounter many boulders of impressive size on the trail. It zigzags through a fern-dotted forest, but is easy to follow and blissfully all dirt, after this snow-heavy winter and has a moderate elevation gain. As you climb, the rocks and ferns will give way to an impressive cinema-worthy landscape of massive downed trees. The trail itself is completely clear, due to impressive work by the Washington Trails Association. Along the way to the final “Balcony” or viewpoint, there are several others that offer impressive views—a nice compensation for the fact that you are never too far from some road noise of I-90. 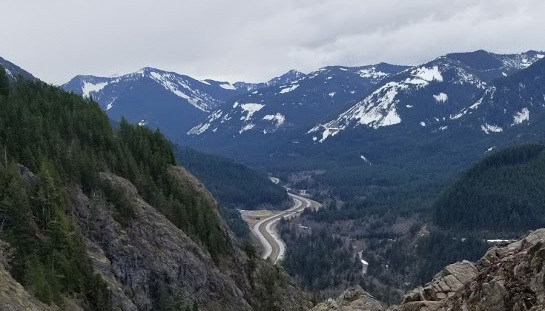 There is a final push from the main trail, up a short steep section that gets you to the Balcony—a view east of the Snoqualmie River Valley. You’ll see I-90 way down below, and McClellan Peak and Defiance Ridge at the other end. Snoqualmie Pass is ahead as well. After a break at the Balcony, you can head back down, or for those looking for more climbing, go back to the main trail and continue on to the Museum and the summit. While the entire trail to the Balcony is snow free, an hour’s climb from there will put you back in the white stuff until the weather is a little warmer. Heed that signs that say to beware of the cliffs—the rocky outlooks of this hike all have steep drops below. Dogs should be kept on leashes, and little ones close at hand. But this easily accessible I-90 corridor hike is a great first spring outing to get the hiking boots (and your muscles!) loosened up for summer trails.